Twisp doesn’t look like an old mining town today, but it was once. 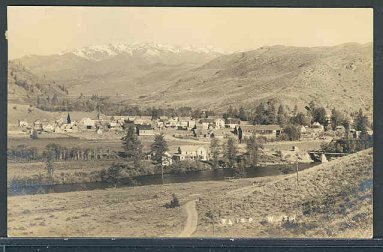 When mineral discoveries were made up the Twisp River Valley a supply point called Twisp came into being. 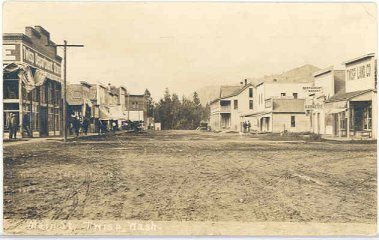 Soon its streets were clogged with prospectors heading up the Twisp River Valley or further north, into the Slate Creek Mining District. 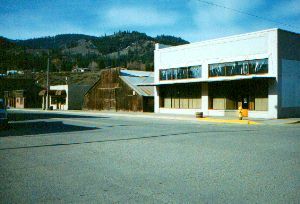 Twisp grew considerably and its business district consisted of dozens of businesses. Twisp today is more of a tourist and community town. 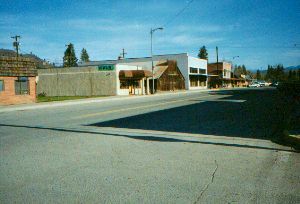 Twisp main street. The name Twisp may have been derived from an old Indian word "T-wasp," which meant yellow-jacket. 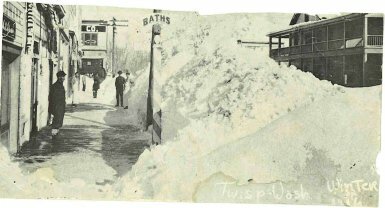 Twisp was originally known as "Gloversville." Original homesteader, H.C. Glover homesteaded where the townsite of Twisp stands today. He registerd the townsite as Gloversville in 1897. 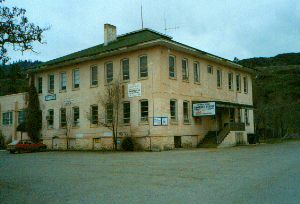 Twisp school built in 1911 serves multiple purposes today as Twisp's community center, and Farmer's Market during the summer months. This old Derby's Saloon token was unearthed while metal detecting in the area. 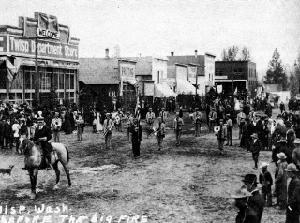 It was good for 10 cents in trade at the Derby's Saloon in the background of this old picture. The history of the Alder Mine near Twisp does not have the legends, and lively stories attached to it as was associated with Squaw Creek, Montana, Gilbert and Red Shirt claims. Yet the Alder Mine has been one of the most productive mines in Okanogan County, yielding over one million dollars in zinc, silver, copper and gold. "Alder Mine Brings Fortune in Eight Months Output"
In less than the last eight months of 1939 the Alder Group Mining company and its lessee, the Methow Gold corporation, have received in net smelter returns $228,660 for ore and about $6,000 for concentrate from Tacoma smelter, it is reported in the Spokane-Review. This was for 230 carloads of ore and four carloads of concentrate shipped up to about December 15 from the mine and mill near Twisp, Washington. Since December 15, and for one and one-half months previous thereto, shipments have been made at the rate of two carloads daily. The source of this ore is a vein a few feet in width at the surface and 30 to 40 feet wide on the No. 2 tunnel level. Width estimates up to 60 and 75 feet that may be heard. For years men are said to have tripped on the outcrop and passed on. In 1896, while panning near the mouth of Alder Creek, T.H. 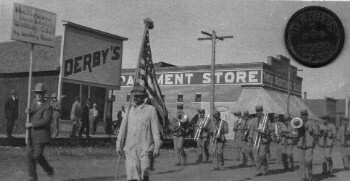 Culbertson found traces of gold. Culbertson kept working up the creek until he came to an outcropping rich in minerals. Later this site became the Alder Mine. A large stamp mill was built near the mouth of Alder Creek and this mine and mill operated off and on over the years. When the price of zinc fell the mine shut down. The old Alder Stamp Mill still stands today on private property. A local realtor recently had it listed for sale.